The editor behind a front page which promised more powers for Scotland if voters rejected independence now says he has always thought it should be a sovereign nation. Former Daily Record editor Murray Foote came out in support of Scottish independence last month in a piece for The Times, but has now revealed his belief in the “concept” is not new-found. 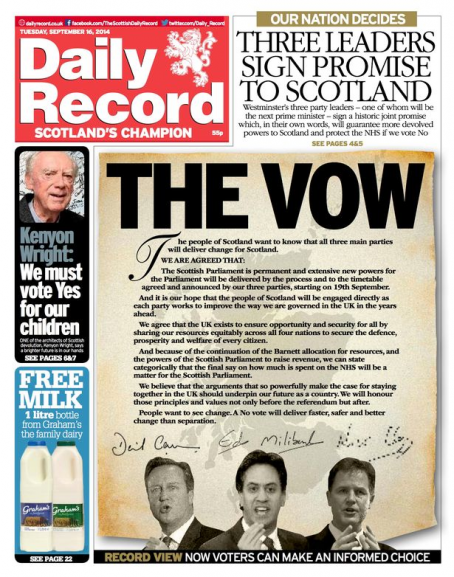 Two days before the vote in September 2014, Murray’s award-winning ‘The Vow’ splash appeared on the front of the Glasgow-based Record – featuring a pledge signed by David Cameron, Ed Miliband and Nick Clegg promising the Conservatives, Labour and the Liberal Democrats would “guarantee” more devolved powers to Edinburgh in the wake of a ‘No’ vote. Murray has now spoken to pro-independence daily The National following his Times piece, and said he wanted to correct a misperception that he had undergone a sudden to the cause. He told the Newsquest-owned title: “The reality is I have always thought as a concept that Scotland should be independent. I think that is the situation a lot of Scots find themselves in. Their heart says Yes and their head says No. “I think the intervening years since the referendum has allowed my head to come into line with my heart. It was not a Damoclesean conversion, it was a realignment and consolidation of my belief that Scotland should become independent. Asked whether he now regretted the ‘Vow’, Murray added: “Absolutely not, the Vow was done in good faith at the time it was done and I do not recognise any suggestion it affected the material outcome of the vote… it was pretty obvious it was the economy. I can well understand and applaud the desire of many in Scotland for independence; some of us south of the border wish it for England, too. What I’m unable to grasp is the notion that Scottish independence is compatible with membership of the European Union, since no EU member state is a sovereign nation. That’s one of the reasons for the majority Leave vote in England.